This set of Molecular Biology online quiz focuses on “The Genetic Code – 2”. 1. According to pairing concept of wobble hypothesis base “I” in the anticodon does not pair with? Explanation: The wobble hypothesis does not permit any single tRNA molecule to recognize four different codons. Three codons, A, U and C can be recognized only when inosine occupies the first (5’) position of the anticodon. 2. Which of the following is not a chain termination codon? Explanation: The universal chain termination codons are UAA, UAG and UGA. UGG codes for tryptophan according to the universal genetic code. Explanation: The first amino acid added is methionine which is coded by the codon AUG. Thus, the anticodon for this codon in the tRNA is UAC. 4. The modification of which base gives rise to inosine? Explanation: Inosine arises through enzymatic modification of a base present in an otherwise completed tRNA chain. The base from which it is derived is adenine, whose carbon 6 is deaminated to give the 6 – keto group of inosine. Explanation: Chain termination codons UAA, UAG and UGA, are read not by special tRNAs but by specific proteins known as release factors. RF1 and RF2 are found in bacteria and eRF1 in eukaryotes. 6. With respect to the genetic code reading frame which of the following is wrong? Explanation: The message from the mRNA is translated in a fixed reading frame, which is set by the initiation codon. Translation starts at an initiation codon located at the 5’ end of protein encoding sequence. Because codons are non – overlapping and consists of the three consecutive nucleotides, a stretch of nucleotides could be translated in principle in any of the three reading frames. Explanation: The universal mRNA code for methionine is AUG. The mitochondrial mRNA code for methionine is AUA. 8. The mitochondrial genome has _____________ stop codons. Explanation: The mitochondrial genome has 4 stop codons. They are UAA, UAG, AGA and AGG. But the universal code has 3 stop codons that are UAA, UAG and UGA. Explanation: Fruitfly mitochondrial codes AGA and AGG codes for serine. In case of the universal codon AGA and AGG codes for arginine. 10. With respect to the universal genetic code pick the odd one out. Explanation: UAA, AGA and CUG are variations found in the universal codon where as UGG is not a variation. UAA – Glutamine codon in some unicellular protozoa whereas codes for chain termination in the universal codon. AGA – Stop codon in mammalian mitochondria but is the universal code for arginine. CUG – Serine codon in the yeast (Candida) but is the universal code for leucine. 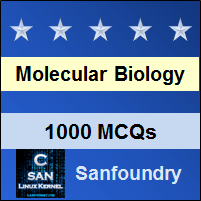 To practice all areas of Molecular Biology for online Quizzes, here is complete set of 1000+ Multiple Choice Questions and Answers.